In a mixing bowl, combine the ground beef, pepperoni, pizza sauce, Italian seasoning, garlic and onions. Divide into four equal parts and pat into burgers. Salt and pepper each burger to taste. Fry the burgers in a large skillet or they can easily be grilled. Cook approximately 6 minutes on each side or until they reach the desired doneness. Place a slice of mozzarella or provolone cheese on each right before they are finished cooking. Allow the cheese to completely melt over the burger. 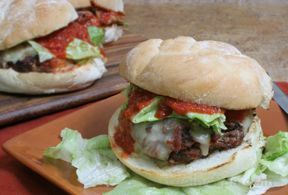 Spread a tablespoon of pizza sauce on each bun. Place a burger on top with lettuce and tomato.